Observation - Gall on Oak tree - UK and Ireland. 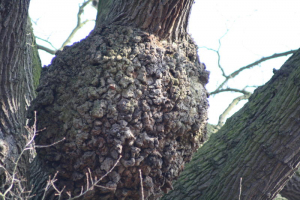 Description: Massive tumour-like growth on oak tree near lake in Hatfield Forest. Probably caused by an insect, the gall protects the insect's larvae. It does not appear to have harmed this magnificent tree. Massive tumour-like growth on oak tree near lake in Hatfield Forest. Probably caused by an insect, the gall protects the insect's larvae. It does not appear to have harmed this magnificent tree.